Some followers have had difficulty in navigating to our Crowd funding page. Here is a quick link – just click on the link below…………. We are sure that the Monifieth Community would like to know how the appeal is going. We asked for donations by cash/cheque to 81 High Street or by bank transfer. Then later a Crowd funding account was set up. Just click on this link …. We Need £10000 for 28th April 2019 to secure the lease . Appeal for £6000 launched 11th March 2019. Thursday 7th March, 7pm, 81 High Street, Monifieth. The first meeting of the newly formed Management Group. It has been a busy time since the 6th February and I feel overawed at the speed at which the Fund raising sub group raced into action. It suddenly appears as though we are moving towards a successful ending towards securing the lease of 81 High Street, the former Angus Access /Police Office to reopen the House of Memories in greatly improved appropriate accommodation for 1st June 2019. 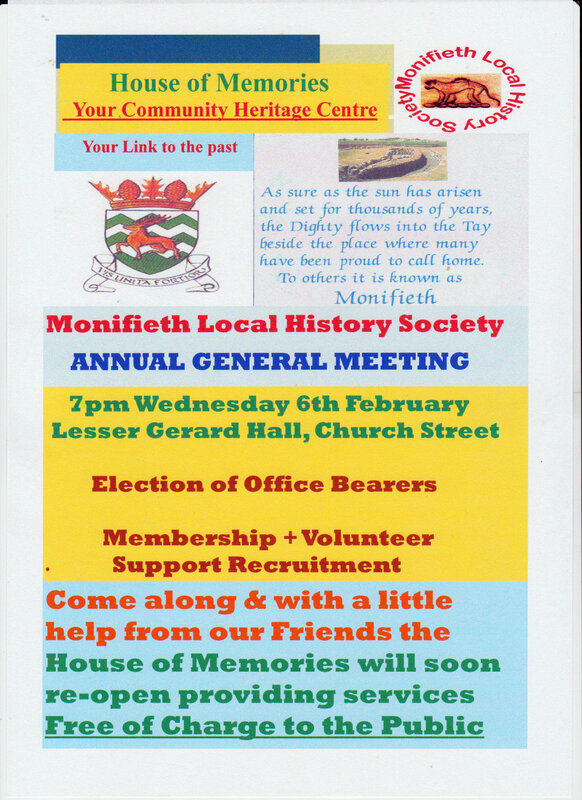 In September 2020 perhaps we will be able to host a celebration of the formation of Monifieth Local History Society in 2000, and recognise all those committed members who have in the past shared their knowledge and skills to bring us this far, working to preserve Local heritage and Monifieth’s past for future generations. There is still much hard work to be done, and many hurdles to be overcome, however having now reached this crucial stage, I feel confident that with the offered support of Monifieth Community, who we serve, then the House of Memories will flourish bringing unlimited opportunities and benefits to all ages and interests. The Past is now history. The future is in our hands. Since our last meeting on 23rd January 2019 there have been so many happenings it is difficult to know where to start. Our work and plans are creating interest. This was highlight by the request from STV News on 15th January to be interviewed and filmed for the six o’clock news. The story seemed to go down well, but I am still puzzled at who the old woman was who accompanied Marianna, our shining star. Can I also add that we have interest from others. Preparations for the Public meeting on 16th January were going well until mid Monday 13th January I was notified that we could not have the use of the Community Cabin resulting from a booking problem. All other local venues for meetings were already booked. Eventually we were, at very short notice, able to get the use of the Lesser Gerard Hall. My grateful thanks, to all who made this possible for the meeting to go on. Twenty two members of the Public attended, with several signing Volunteer forms, with one person signing Membership and Volunteer forms. Two of those present were representatives of McDonalds, Ethiebeaton, who offered their support, and the desire of their staff to ‘sign up’ as volunteers. A pupil from Monifieth High School wished to volunteer as part of his Duke of Edinburgh Award project. All very positive. There were among those present who agreed undertaking various roles in the Management of the House of Memories, and becoming part of the management Group. We do need a Secretary and I am sorry to report that due to ill health our Treasurer will not be standing again for Office. The Chairperson of Monifieth Community Council suggested that I remain in Office as President of MLHS until the relocation and improvements plan were completed. I did not say “No”. The AGM for the Society is scheduled for 6th February 2019, at 7pm in the Lesser Gerard Hall. We must now face the task of moving forward with those who support our ideas, and towards a date of entry to legalise the lease agreement in early May 2019, with a proposed official opening day 1st June 2019, when Membership fees are due for renewal. Finance with community fund raising for £10000 being ‘top priority’ between now and 28th Apri1.2019. We can then say: ” We Together the Monifieth Community did it!………….. we made history”. Due to circumstances outwith our control we have found it necessary to change the venue of the Public Meeting to the Gerard Hall, Church Street, Monifieth at the same time of 7pm, Wednesday 16th January 2019. Apologies for any inconvenience caused by this problem. Monifieth Local History Society are ready and willing to move forward with the establishment of Monifieth Communiit Heritage Centre assisted by some of the hundreds who `signed up` declaring their support . Their support is needed now to move on to the next stage of the ambitious project. Monifieth Local History Society and representatives will be there. Will you or yours? in the Monifieth Community Cabin. South Union Street.